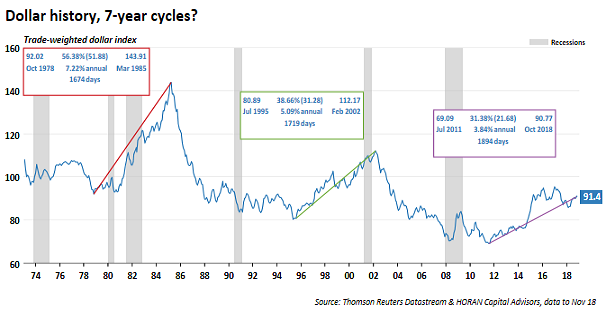 Historically the U.S. Dollar has had a tendency to exhibit strength over a 7-year cycle. In July of this year the Dollar strength cycle crossed into its eighth year though, as seen in the below chart. One factor impacting the Dollar's rise is the increasing interest rate environment in the U.S. relative to rate moves outside the U.S. The U.S. Dollar has a high positive correlation (+.71) to the direction of interest rates. The Fed Funds rate of 2.25% in the U.S. compares to the ECB's target rate of zero. 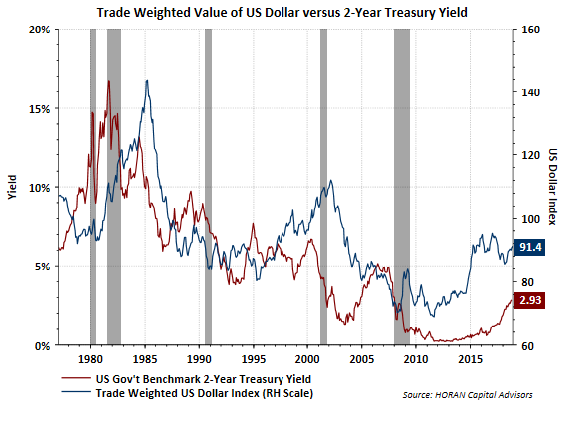 This rate differential is seen across other bond maturities and makes the U.S a potentially more attractive investment relative to some of the lower rates in the developed foreign markets. As an example, the yield on the 10-year German Bund is currently .40%, down from .80% earlier in the year. The US 10-Year Treasury currently yields 3.18% and is up from 2.50% at the beginning of this year. With higher interest rates likely into next year in the U.S., the Dollar may strengthen further. The stronger Dollar is one factor that is leading to lower U.S. oil prices. 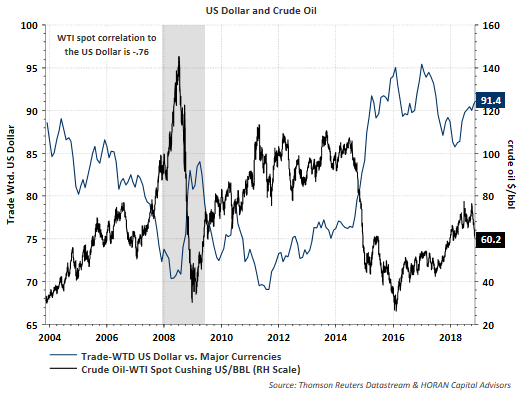 The price of oil has a minus .76 correlation to the Dollar, that is as the Dollar rises, the price of oil declines, all else being equal. At the end of last month I noted the negative impact on emerging market returns due to the Dollar as well. This Dollar headwind is applicable to international investments broadly as seen in the chart below. 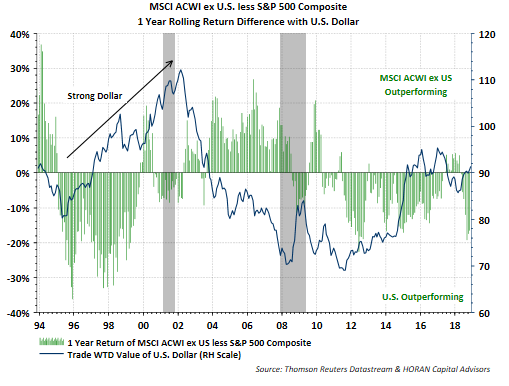 The chart compares the rolling 1-year return for the All Country World Index ex U.S. versus the S&P 500 Index. Of course other factors influence foreign equity returns, and one negative one at the moment is the tariff/trade issue. I believe we are nearer the end than the beginning of this Dollar strength cycle, but it likely continues into 2019. What seemed like a 7-Year cycle for Dollar strength in the past, may be influenced more by interest rates. As the rising interest rate cycle comes to an end in the U.S., so should the move higher in the Dollar, albeit with a lag of about 12-months.